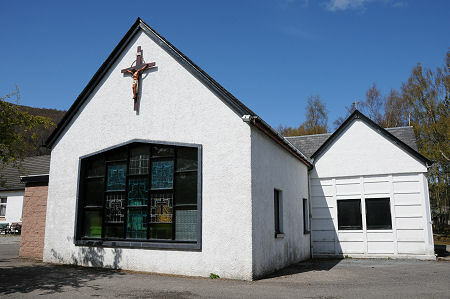 St Aidan's Roman Catholic Church can be found on the west side of the main road into Aviemore from the south, very close to Aviemore Youth Hostel. The white painted building stands slightly above and back from the road, partly screened by trees. Parking is available immediately in front of the church. 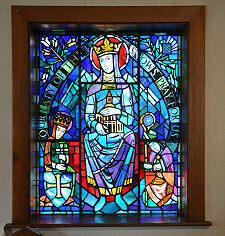 Visitors to the church find themselves in a friendly and welcoming space roughly aligned from north west to south east. Entry is via a brick porch, which brings you into the south east end of the church. This end is dominated by the large main window, whose nicely coloured and decorated panes look very much like a shop window from the outside. There is no such illusion from the inside, where the design can be fully appreciated. The pews all face north west, towards the main altar at the far end of the church. 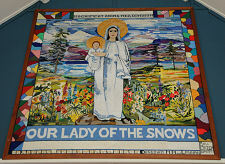 Set within the roof above the "nave" is a large tapestry celebrating "Our Lady of the Snows", a highly appropriate depiction of St Mary for a church set within a ski resort. As you reach the north west end of St Aidan's it becomes clear that what initially looked line a simple rectangular church is actually T-shaped, with side aisles facing in towards the altar. A particularly nice touch at this end of the church, and elsewhere, are the beautiful stained glass windows. 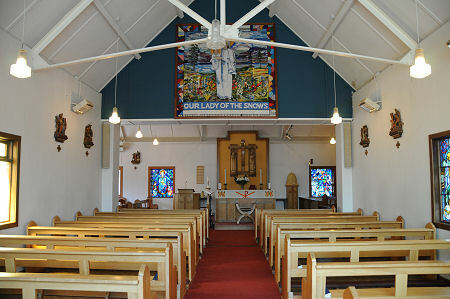 St Aidan's serves a parish which extends for some distance around Aviemore, and forms part of the Roman Catholic Diocese of Aberdeen. Wherever you are in Scotland, it's usually possible to find out just about everything you could possibly want to know about anything you see of interest. There is often information available on site, and failing that there are always reference books or online sources of information. For some reason St Aidan's Church is an exception to this norm, which in some ways adds to its attraction and its interest. 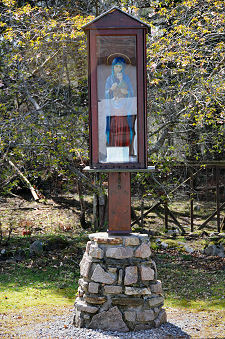 We don't know how old it is, or who designed it, or where Roman Catholic worship took place in Aviemore before it was built. There is one partial clue outside the church. There is no graveyard as such, but a nearby enclosure does contain the grave of Patricia Anastasia Keogh who, her headstone records, "built this church". The lady in question died on 24 September 1956, aged 70, which means that St Aidan's Church must have been built before that date.